The Engagement letter can be a pre-agreement document used to ensure that a client is serious about working with you. If they will not sign an engagement letter you will be saved the time and expense having to have a more detailed contract drawn up. This Engagement Letter is included in editable Word format that can be customized in Word or by using the included Wizard software. How do you write a Engagement Letter document? THIS AGREEMENT is made this Current Day day of Current Month, Current Year by and between Company Name ("Company") and Company Name ("Customer"). We are pleased to accept your engagement to provide Insert service description here services to you on an ongoing basis. This agreement's purpose is to help define the capacity of Company Name and to set forth the conditions and expectations under which Company Name will work on your behalf. We shall have full discretion, subject to your prior approval, to engage our own employees, subcontractors or third parties to perform the services described. Any employee or subcontractor we contract with shall be considered an extension of Company Name and subject to any confidentiality agreements and provisions Company Name may be subject to while working for Company Name. Work shall be performed either as task-based (fixed price) or hourly, depending on the circumstances or in the case of troubleshooting technical problems. Work may be requested in person, by phone or email and always by unilateral agreement. Company Name will quote estimates for tasks and seek approval by one or more of the above methods. Usually a Scope of Work shall be provided to Company Name at every opportunity for approval or guidance. We will submit itemized invoices for work performed every thirty (30) days. Large expense items (pre-approved by Customer) will be billed as incurred. Typically invoices will show the individual performing the work as well as the rate on an hourly basis. Company Name reserves the right to withhold or terminate services at any time if customer fails to pay invoices in a timely manner. Company Name may also request that Company Name provide billing updates from time to time to aid budgetary control. No agreement between Company Name and Company Name shall preclude future services for other customers deemed adverse or in competition, directly or indirectly, with Company Name. We understand that during the course of this engagement we may encounter sensitive or confidential information relating to Company Name's business, customers, vendors and method of doing business. Company Name shall never disclose in any shape or form any confidential information, trade secrets, practices, methods or any information deemed sensitive and not made available to the public. We value our relationships with our customers, and we look forward to working with you on all future matters. 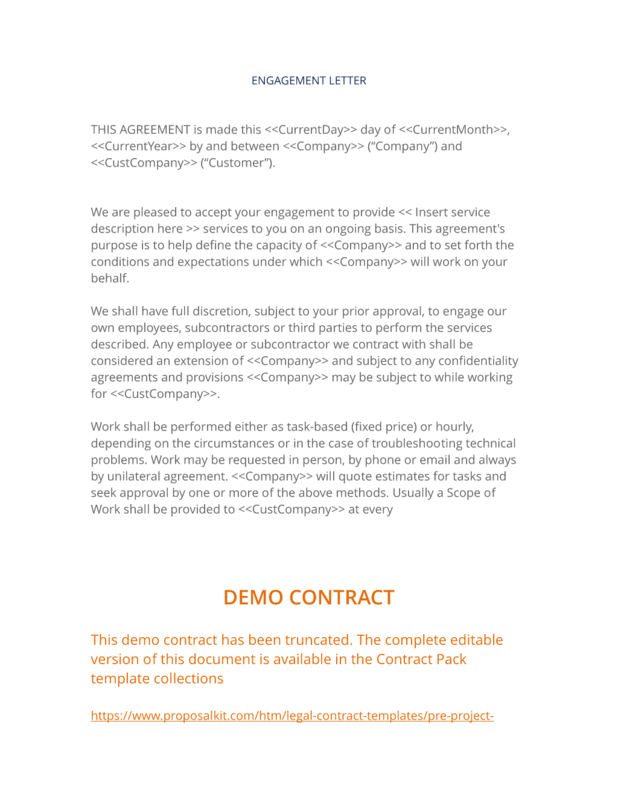 The complete Engagement Letter - with the actual formatting and layout - is available in this Contract Pack.